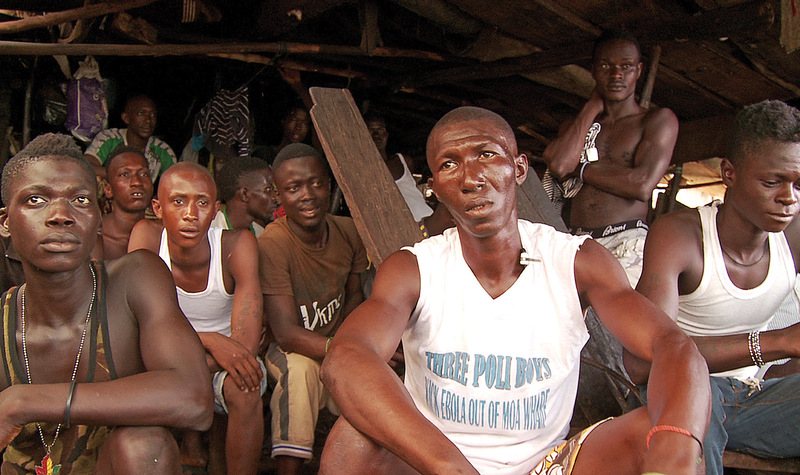 Gangsters turned mobilizers, the Tripoli Boys kicked Ebola out of their neighbourhood. Amjata Bayoh and Mohamed S Camara find out what happened next. Colonel Qadafi and the Tripoli Boys at the barracks in Moa Wharf. Rising out of a fetid, grey Atlantic on Freetown’s eastern flank are the barracks of the Tripoli Boys. 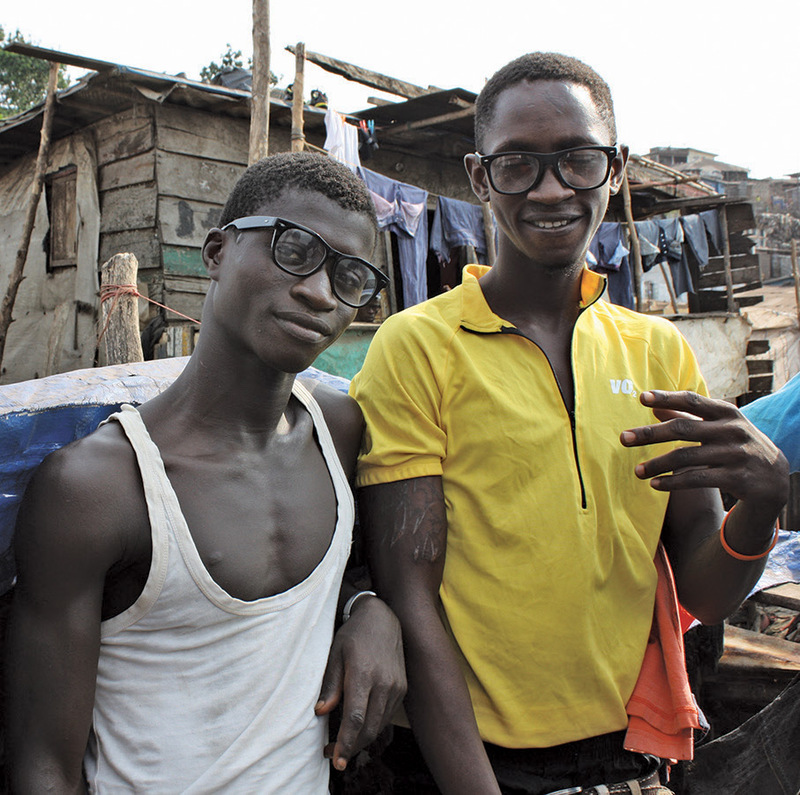 These are the headquarters of ‘Colonel Qadafi’ – a sort of benign Fagin – who leads a band of 40 young men from Moa Wharf, known as one of Sierra Leone’s toughest slums. When the first Ebola case was reported here in April 2015, it had all the makings of an unmitigated disaster. 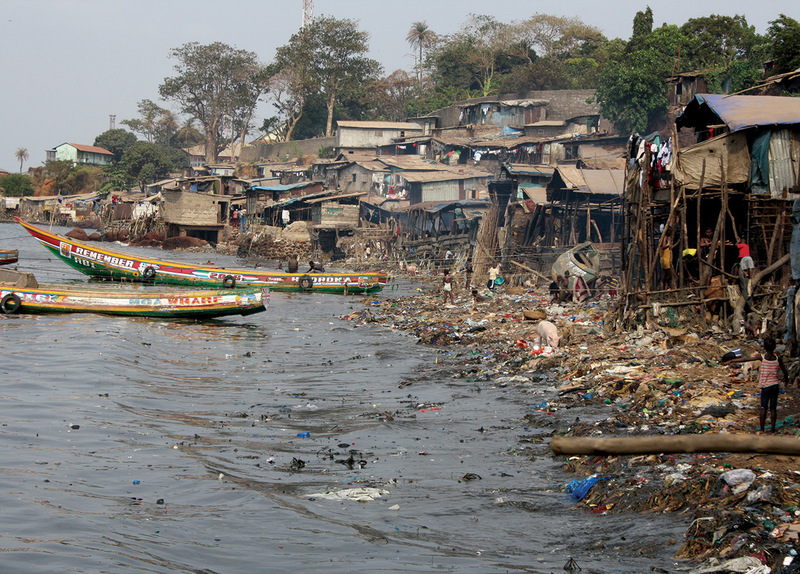 The slum is home to some 8,000 residents, who live packed into a one-kilometre square area of shacks straddling open waterways overflowing with sludge. But instead, Moa Wharf became a poster child for an effective Ebola awareness campaign, partly due to the efforts of the Tripoli Boys. And when they joined forces with the WHO and the Social Mobilization Action Consortium, the Boys also forced a re-think by those who had written them off as trouble – prone to drinking, getting stoned, fighting and thieving. The Tripoli Boys gather for the interview in the barracks, where piglets are sleeping in piles on the spongey dirt floor. The pigs – which Qadafi describes as ‘soldiers’ – are being raised for sale, one of many efforts to generate income. Among the pungent smells of smoked fish and sweet, rotting rubbish, Qadafi says he offers shelter and opportunity to the Boys, who have to fill out an application form to join. He introduces them by their nicknames: ‘Steven Gerard’ in black plastic shades with clear lenses, Blufferman, Sevenshot, Staffi and Savage… (the latter, it turns out, named for his easy-going personality), before handing over to Maurie Camera, the group’s spokesperson. The view from the barracks. My nickname is Five-0 (it means ‘people will die for you’). I got it because I try to build people up. I used to have a bad relationship with the elders. But the Ebola training gave us the opportunity to work with community leaders. We learned how to win people’s trust, they taught us about the illness, how people could protect themselves. We reassured them, told them to bring out their sick, that they would not be killed (as they feared). We gave them confidence – ‘do not be afraid, come and tell us how you are feeling. We will take you to the hospital and then see that you come back.’ That was what we did. Our leader Qadafi caught Ebola but he survived. While he was sick, his fishing boat was torched and the barracks were flooded. We also lost seven of our boys to Ebola. When we saw that our people were suffering, that gave us the courage to do this work, not for ourselves, but for everyone. When we backed things up, Ebola died down, as is it now. I believe if it wasn’t for us, this place would have been empty; everyone would have died. We are happy Ebola is over. One thing we would like, though, is some recognition for the work we did, so that people will say, ‘these are the boys who helped in the fight against Ebola.’ I know they have ways to do that. We don’t want to be living here in this place like this, with the pigs. We have nothing to do…! We want to mingle. That would motivate us to do more in the community, not only here, but for the country as a whole. If there was an event, where there were two or three hundred people standing saying, ‘These are the boys! These are the boys who fought Ebola!’, then, if we wore our ‘Kick Ebola Out’ T-shirts on the street, people would recognize us. That would be a boost for us; they should do that. As told to Amjata Bayou and Mohamed S Camara.